Phil Simms is a former Super Bowl MVP with two rings, two Pro Bowl appearances and a resume that could earn him a place in Canton. His 88 percent completion rate in Super Bowl XXI is still a Super Bowl record. 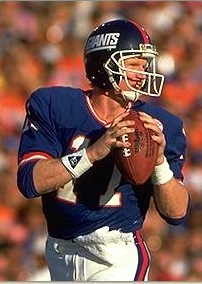 In 1993, his final year in the NFL, Simms completed 61.8 percent of his passes and threw for 3,038 yards and 15 touchdowns. At the end of the offseason, the Giants cut him and he retired for good. Simms went on to have a successful broadcasting career. He’s worked for ESPN, NBC and CBS. He announced Weightlifting at the 1996 Olympic Games and in 2008, Simms joined the cast of Inside the NFL, the weekly football highlight show that ended up on Showtime after a 31-year run on HBO. Simms also found time to produce two serious quarterback prospects. Phil’s son Chris Simms had a promising career with the Bucs before blowing up his spleen in a 2006 game against the Carolina Panthers. Matt Simms, Phil’s younger son, is currently the starting quarterback for the University of Tennessee. Print article This entry was posted by Chris Stout on September 27, 2010 at 11:41 am, and is filed under Sports. Follow any responses to this post through RSS 2.0. Both comments and pings are currently closed.